A signboard outside desc­ri­bes Imbiss as ‘The Meating Joint’. And the moment you glance at the menu of this new German restaurant in Colaba, you know why. For while the veggie options are skimpy—the waiter mumbles something about veg pasta and an eggplant entree—meat lovers are likely to be in heaven. For this small restaurant offers a mind-boggling array of carnivorous delights. Rabbit terrine, duck sausages, haggis, blood sausages, gui­nea fowl in a wine sauce, ox tail stew, bratwurst sausages. Sitting in the tavern-like eatery looking at dishes like pic­kled eggs and turkey schnitzel, it’s like we’ve wandered into a German fairytale. As soon as we settle down, the children decide on Sausage Poppers (Rs 225)— chicken sausages cut into small pieces and deep-fried—and a Signature Sausage Platter (Rs 50). Both are extremely successful as is the yummy Cheese Garlic Bread (Rs 180) while the sour pickled quail eggs (Rs 125) are fun and sati­sfy a long-held curiosity. After some dithering, we choose the fabulous Chorizo Rice topped with a duck’s egg (Rs 200), the somewhat disappointing and stodgy Beef Cheek Sliders served in mini hamburger buns (Rs 150), Braised Duck leg served with a lovely gravy (Rs 300) and the enjoyably smoky Grilled Pork Tenderloin (Rs 225). 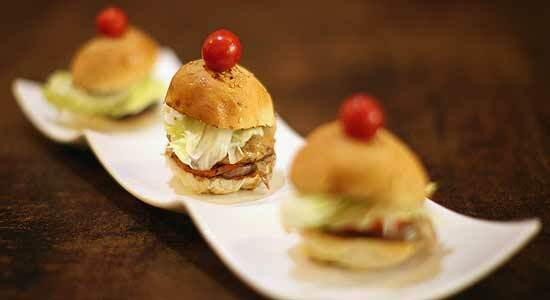 The Ham and Bacon sandwich (Rs 225) is generously packed with meat and lettuce. The service at Imbiss is excell­ent—and the friendly waiter informs us that all the meats are processed at their own factory in Thane. The dess­ert options are limited—and we are just too stuffed for cheesecake anyway.